Home > Blog > The Manchester Fly Story. It’s the time of the year when an amazing vacation is due. There is a lot of hustle and bustle witnessed at the airports. All the merry travelers are trying to get to their destinations so that they can spend the Christmas holidays with their friends and families. This festive period is going to bring a lot of passengers through Manchester airport. According to certain estimation 377,500 travelers will be flying out. This figure consists of 16,000 more travelers than the last year’s record. There is another count of 53,000 flying out on 28 December. It’s quite fascinating how the authorities manage everything with these huge numbers flying through Manchester Airport every day. 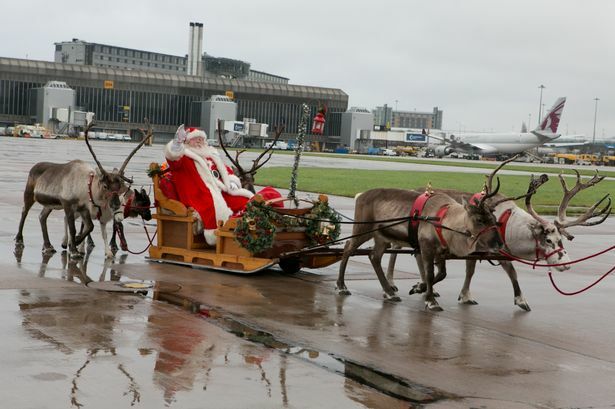 As a part of Christmas festivities, the M.E.N was greeting all the passengers at Arrival and Departure. Also at one terminal a Santa was handed out 500 gifts to the travelers including televisions, cupcakes etc. Among those gifts was a small rocking horse given to a 1 year old baby girl. The time is good and the spirits are high for this is how it should be on Christmas. That’s not it. There are some new routes being introduced at Manchester Airport, such as a direct flight from Manchester to Jeddah via Saudia Airlines. Manchester Airport is providing all these services with fervent. If you are traveling through Manchester Airport couple your travel plans with a well furnished Manchester Parking plan too and cherish every single moment of stress-less, hassle-free and relaxed traveling. Previous PostA Tale of Gatwick Airport.Next PostAn Account of Heathrow Airport. I think everyone could learn slightly from your own experience. Just wish to say your article is astonishing.The clearness in your post is simply nice and i could assume you are an expert on this subject. let me to grab your RSS feed to keep up to date with your forthcoming post. Thanks a million and please continue the work.